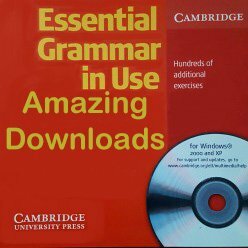 This exciting new system gives you hundreds of practice exercises , providing further practise of all the language taught in Essential Grammar in use. A Variety of games and exercises make learning fun. Make your own tests: Choose from over 600 grammar questions to test the areas that you want to practice. Interactive speaking exercises provide extra practice at the end of each section. Learn english easily at the comfort of your home. Get ready for Cambridge english test. The contents of this disc are distributed freely and globally under the terms of the GNU Public License, the GNU Lesser General Public License (LGPL), or have redistribution allowed under the included licenses. The charge for this product is related to costs we incur distributing the software. This item does not infringe any copyright, trade mark, or other rights or spam policies. This product is fully compliant with VeRO programme and foreign laws. All other trademarks are acknowledged as belonging to their respective owners. The system is for Widows only (any version from XP).